Joe Scarborough today continued his new Morning Joe routine of making anti-Israel remarks and then shouting down anyone who disagrees. Unlike the previous editions of the MSNBC morning show in which the former congressman focused on insulting his critics in the media, on the July 5th edition, Scarborough opted to attack a recurring guest at the program’s roundtable discussions, Donny Deutsch, no conservative stalwart he. Donny, hold it, hold it. So let me step on here. We're not going to cure 3,000 years of -- in the remaining two minutes that we have. The Morning Joe host asked Deutsch, “what do you expect him (the ambassador) to say?” to which he shot back “how do you expect me to react?” “If we are going to move forward,” Scarborough concluded, “you have to understand, he represents a people who have had 5, 6, 7-year-old people dragged out of their homes dead.” Apparently in Scarborough’s eyes, Palestinian diplomats have no obligation to condemn the terrorist organizations which are doing damage to their stated cause of a peaceful Palestinian state bordering Israel. JOE SCARBOROUGH: Yeah and of course, Chuck, you saw The Wall Street Journal this morning said the White House, the last attack on the U.N. School was a final straw for the Obama administration. They, obviously, sent out a State Department spokesperson who basically said enough is enough. CHUCK TODD: And you get the sense that Israel really listened. TODD: And by the way on Friday, the president went out there and gave his most supportive statement of Israel since the war began. TODD: So this was a case, which, of course, Netanyahu used to his benefit the next day to basically saying, “Hey, America is standing by us on this” and then that happens. It does feel as if, you know, and Israel will say we accomplished our mission any way. 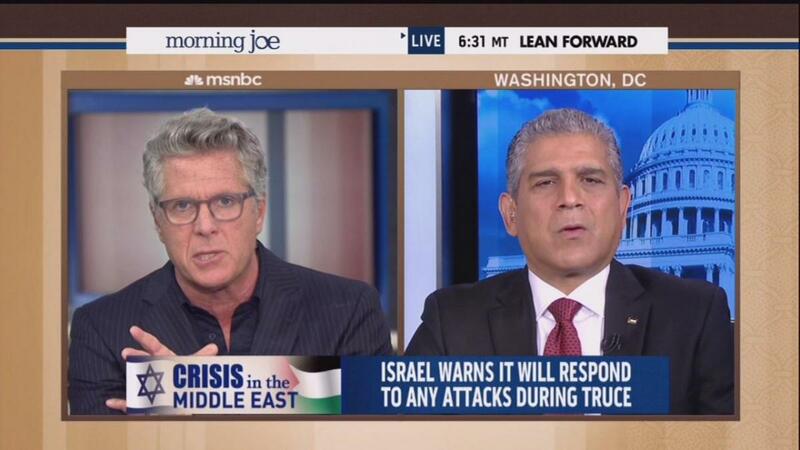 DONNY DEUTSCH: Let's just, let’s just not forgot that Hamas is a terrorist organization and Israel is a democracy. Just saying. TODD: The only democracy. There is only one. MIKE BARNICLE: We agree with you. SCARBOROUGH: Who disagrees with that? DEUTSCH: So who is to blame? Is Hamas to blame? SCARBOROUGH: Hamas is to blame. Let me just ask you something, if your child is being held with a gun to their head do you want the cop to shoot through your child to kill you? SCARBOROUGH: It is absolutely abhorrent. But, but, but the question is if the United Nations warns 17 times, 17 times. DEUTSCH: Our nation is not living in Israel. SCARBOROUGH: This is a shelter. So, Donny, should this have continued? DEUTSCH: I think Israeli accomplished its mission. DEUTSCH: Which was to shut down the tunnels and keep Israeli safe. Hamas wants to obliterate Israeli. We forget that is their mission. SCARBOROUGH: Let me finish my point. Saudi Arabia is against Hamas. The U.A.E. is against Hamas. DEUTSCH: Hamas is not attacking these people. DEUTSCH: But they are not attacking Jordanians. They are not tacking those people. SCARBOROUGH: It shows you how isolated they are. Donny, when you continue attacks that continue to show across the world 5, 6, 7-year-old children dragged out of rubble dead when they are running with their parents to try to hide in a U.N. School, who does that help? Who does that help? DEUTSCH: What it is the end result is a result of Hamas aggressive moves. SCARBOROUGH: I need you to calmly answer my question. DEUTSCH: Oh, yes, of course. Well, when you -- I'm literally answering the question. SCARBOROUGH: Israeli plays into Hamas' hands. 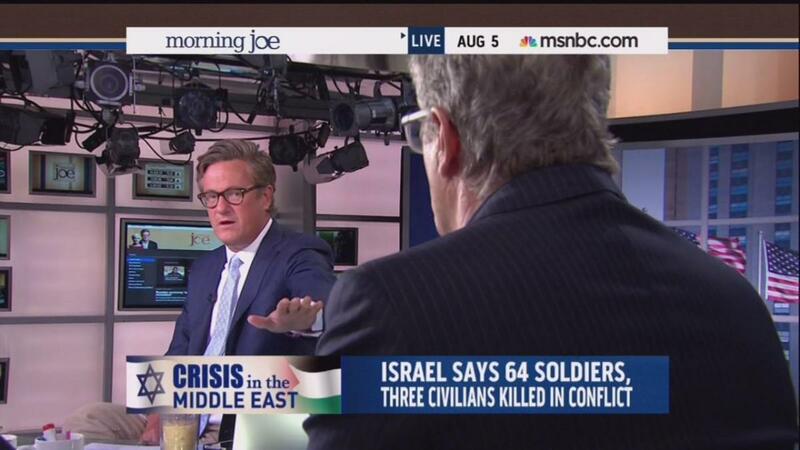 SCARBOROUGH: Hamas celebrates when their civilians are killed, so what does Israeli not do? SCARBOROUGH: And what does Israel do? Israel needs to figure out a way to work with the Palestinian authority to minimize Hamas’s influence. Does anybody around this set, does anybody watching on TV, Andrea Mitchell, I'll ask you. I know it's harder for you to answer, but have you heard anybody suggest that Hamas has not been aided the past three and a half weeks by these attacks, when they were more isolated than ever before? Andrea, maybe I should ask you a news question. Was Hamas more isolated than it's ever been three and a half, four weeks ago and desperate to strike an alliance with the Palestinian authority because it had run out of cards to play? AMB. MAEN RASHID AREIKAT: It takes two to tango. Israel also needs to understand that its blockade of the Gaza strip for the last seven years have [sic] left people in Gaza without any hope. So what do they expect an oppressed people -- when you address an oppressed people through violence, what do you expect the oppressed people to respond by? Through violence! DEUTSCH: Mr. Ambassador, I think Mr. Netanyahu is bragging not necessarily about killing civilians, but basically about shutting down tunnels and pushing back rockets that were meant to try and hurt Israel. And I love when you use the word pragmatic about Hamas. It's a terrorist organization. Nothing pragmatic about that. SCARBOROUGH: Donny, hold it, hold it. So let me step on here. We're not going to cure 3,000 years of -- in the remaining two minutes that we have. SCARBOROUGH: So, Donny, I just, I mean obviously, we could sit here and debate. You're not going to have a guy that's in charge of the PLO delegation going out, attacking Hamas. Of course, Hamas is their enemy domestically as well. So I’m just saying for people at home why didn't you sit there and scream and wave your arms about Hamas, we can do that. But what they're trying to do, though, is what happened in Ireland. Where you actually had guys like Jerry Adams that basically had to drag the most violent factions of the IRA. over and -- drag them over, not attack them publicly and quietly say -- got to say, Jerry Adams, still, one of the -- it's just a shock that Jerry Adams has been able to keep the violent factions in line as long as he has. BARNICLE: That is, that is. SCARBOROUGH One thing publicly but privately, he’s like “don't screw with me. Do not step out of line.” And, Donny, I know, this is a very emotional moment. But we don't want to see this in two or three more years. We don’t want this cycle of violence to continue. DEUTSCH: And it's about the violent Israelis and the pragmatic hamas. DEUTSCH: That's exactly what he said. SCARBOROUGH: Donny, what do you expect him to say? DEUTSCH: How do you expect me to react? SCARBOROUGH: Donny, I understand. I am just explaining. If we are going to move forward, you have to understand, he represents a people who have had 5, 6, 7-year-old people dragged out of their homes dead. DEUTSCH: Yes, of course because they’re used as shields. SCARBOROUGH: That does not matter to the father of a 5-year-old child. DEUTSCH: It matters to this discussion. DEUTSCH: Doesn't solve the problem. SCARBOROUGH: Does not solve the problem. DEUTSCH: Alright, let's leave it at that. SCARBOROUGH: We'll leave it at that.